Ever since Crocodile Dundee hit the cinemas, North Americans think there’s a crocodile in every body of water just waiting to devour unsuspecting victims. Thankfully, throughout all 2,508 kilometres of the mighty Murray (Australia’s longest river and the third longest navigable river in the world) you won’t find a single killer croc. Instead, you will discover breathtaking sunrises that melt into a multitude of colours, sun-baked cliff faces surrounding the river that are red enough to be straight from mars itself, an incredible diversity of wildlife, nights dark enough to photograph the Milky Way and my uncle waking you up at 6am every morning with a very pitchy rendition of “Oh what a beautiful morning”. You can be very thankful that that last one is unique to the “Turner houseboat holiday” experience. Trust me. Spectacular sunrises greet you each morning. We started off our family journey after a lovely and scenic three hour drive from Adelaide to Renmark. With my cheeks full of grapes we safely arrived at the Murray River and our entire family loaded into three houseboats and were ready to go within the hour. The Murray River, South Australia. One positive about a houseboat holiday I noticed right away is that you get to enjoy all the wonderful things about camping with all the luxuries of a hotel – including a hot tub on the top deck! After a quick orientation of the houseboat, we began our 7 day journey through the Murray River – just like that. Each day was a new adventure and had something to behold. On one of the very first days, we hiked up a sandy, red cliff face to a lookout giving us 360 degree views over the Murray and it’s riverlands. I found red sand in my shoes for MONTHS after that little hike. Sandy shoes: there is no escape. We were also a little cheeky and hit some golf balls from the lookout. As well as golfing, we also managed to play some cricket, bocce and frisbee along the river banks when we docked at night. Be careful not to hit the ball into the river or the crocs will get you! Just kidding. At night, our three houseboats would moor beside each other on an open patch of river bank. Though I had no boating experience, my crazy family gave me the chance to drive and dock the boat. I suggest trying out the controls a bit before you fancy yourself the next James Cook – you don’t want to be playing bumper boats. When the sun sinks beneath the sandy cliff face and the sky ablaze with purple hues fades to black, the stars crusade across the sky and showcase the Milky Way in all its splendour. If you’ve ever camped the Australian outback before, you’ll know there’s nothing like looking up into the night-time sky while marshmallows toast by the campfire. 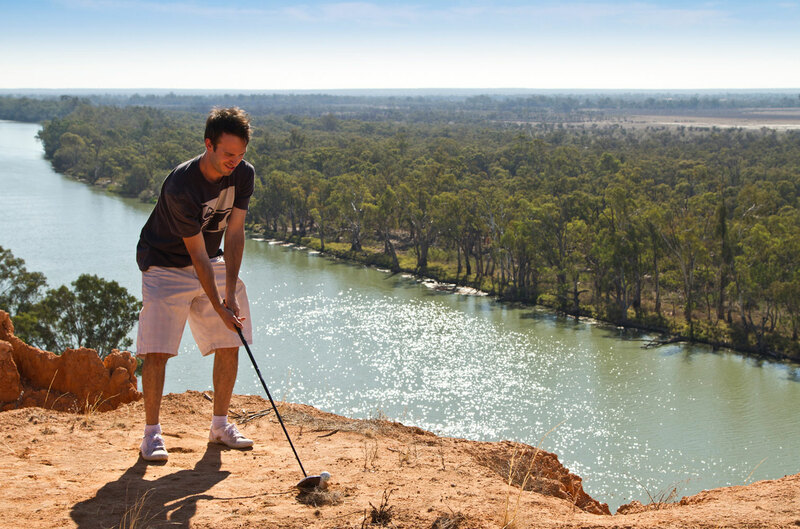 The Murray River’s beautiful seclusion will have you quickly forgetting about city life. The most common neighbours you’ll be seeing here are emus, pelicans, cockatoos and kangaroos. Cast your fishing rod off the side of your boat and you might be lucky enough to catch a Murray cod, catfish, or callop to fry up for dinner. Most likely, as we did, you’ll probably reel in inedible carp. The Murray River Houseboat vacation is perfect for a family holiday full of laughter and fun or quiet moments with loved ones. The natural backwaters of the river provide a serene and pristine retreat for kayaking in untouched wilderness. On one of our early morning kayaking endeavours, black swans graced the riverbanks while pelicans fished for breakfast within arm’s reach – an experience native to Murray River escapades and one I won’t soon forget. Rock formations along the Might Murray. Houseboating Australia’s longest river is a steady and serene holiday adventure perfect for all ages & full of unforgettable sights that regular camping trips simply can’t offer. From the cliff to the river. Backwaters aplenty: a dream for kayaking adventures. Who’s the captain of the ship? Anyone with an unrestricted car licence can get behind the wheel. You don’t need any previous boating experience. All modern houseboats have full kitchen amenities including a sink, fridge, stove, dishwasher and even a barbeque! No need to eat canned beans for days – you can cook just as you would at home. How many people can stay on a houseboat? Do I have to bring my own bedding? Houseboats can sleep anywhere from a cozy and romantic 2, up to a fun filled 12. Basic bedding is generally provided, but it’s a good idea to bring extra blankets for the chilly nights. The bathrooms and showers are very similar to what you would find in your own home or local hotel. How do you know where to pull over to go hiking or play? There are many popular camping spots that are pointed out in a guide that comes with the houseboat, but if you are keen to try something different you can pick wherever you like! Avoid pulling over in areas where there are large rocks or roots as you could crash, damage or beach your boat. Find a piece of shore that is open and free from any obstructions. However, do make sure there are some trees along the shore line that you can tie your boat to. Sandbars are also something to be cautious of – but don’t be frightened. The handy guide will also show you exactly where they are located along the river so you can avoid them. Do I have to bring my own kayak or fishing rod? Yes. These do not come with the houseboat. Don’t forget the bait! In the summer – from December to February. Expect more boats in the river during these months. If you’re planning a houseboat holiday on the Murray River, you’ll get the best bang for your buck just after the peak season (March-May), when the weather is still warm but school holidays are over. If you’re willing to brave the cold you can get an even better deal in the winter months. Remember to pack warm clothes – the temperature can drop at night but that makes for perfect camp fire weather! 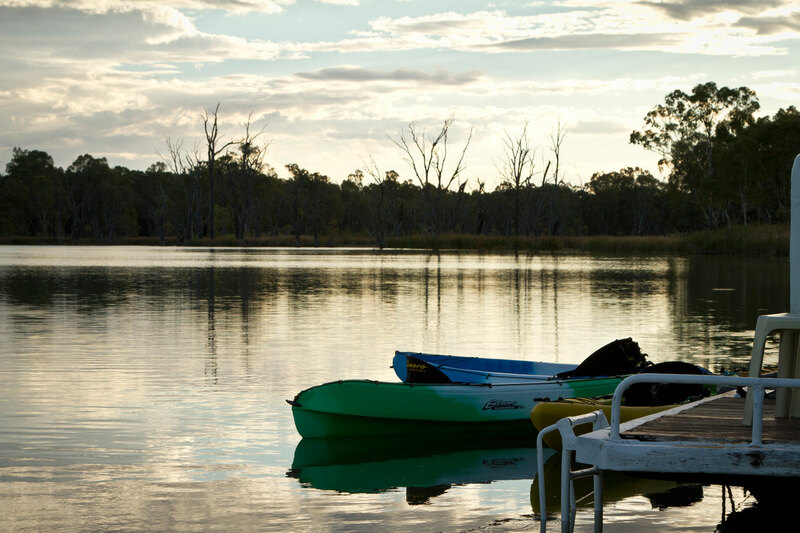 Where can you rent a boat on the Murray River? We rented from libaliba.com.au but there are plenty of others to choose from which is good for healthy competition and price. Happy Google searching. Got questions about houseboating along the Murray River in Australia? We’ve got answers. Ask away in the comment section below. Courtney is a Canadian ex-pat now living in Australia and soon to be married. She's an avid explorer and animal lover with a passion for discovering native wildlife. Her travels have taken her to Europe, Central and South America, Mexico and the United States.